CoLor mega wall, gettin’ trippy with it! Ogosh x Alas really like this. Bine and Haste collab, boys gone large! J Davies, more lovely creations. My favourite of a series of Bubba creations on Ecclesall Road. Corpse, creating an ever expanding array of characters. Shoe and Pawski having a cheeky paint. (Do you see what I did there? 😉 ) Coloquix to the left of me, Brayk to the right, here I am. Surge, Mars And Mace, having a Star Wars moment, awesome! No idea who, but really like it. Have since been informed that it is Form and Scar, thanks for the info 🙂 Sico, in one of my least favourite spots, great piece though. Assuming the snow melts before the end of the year I hope to be out and about, still got a few bits to catch up on. Hope everyone has had a very Merry Christmas, thanks for your support over the past year! Well, I’ve been trying to work on this blog for almost a fortnight, but due to my internet going all nostalgic for the days of dial up, it’s been a fairly hopeless task! Anyway in other news, saw this lovely octopus by XBN7. Rateones’ monster has had an interesting makeover . Cat v Dog, Mila K and Kosh, my moneys on the cat, she’s got a gun!. I do like Sours pieces, always a treat. Coloquix version of Rapunzel perhaps? Tekonta Secta x Corpse, this awesome collaboration is huge, this photo doesn’t really show it’s scale. CoLor, looks like he’s been on some interesting pills….. 😉 MilaK piece for Run The Jewels. The family Stick 🙂 Cantastic Art, getting in touch with his dark side. Zinc x Skint great wall with that pesky little fox getting in on the act. Pawski’s on form, nice view from the sun terrace! Liking this from Solo. Ogosh, love the Bender! Slightly mental piece by Rambo, Toys ‘r’ Them! If my internet gets back to this century any time soon, I’ve got loads more to post! So me and my little dog (who had chronic wind by the way!) got on a train to Birmingham to see what all this City of Colours business was all about. 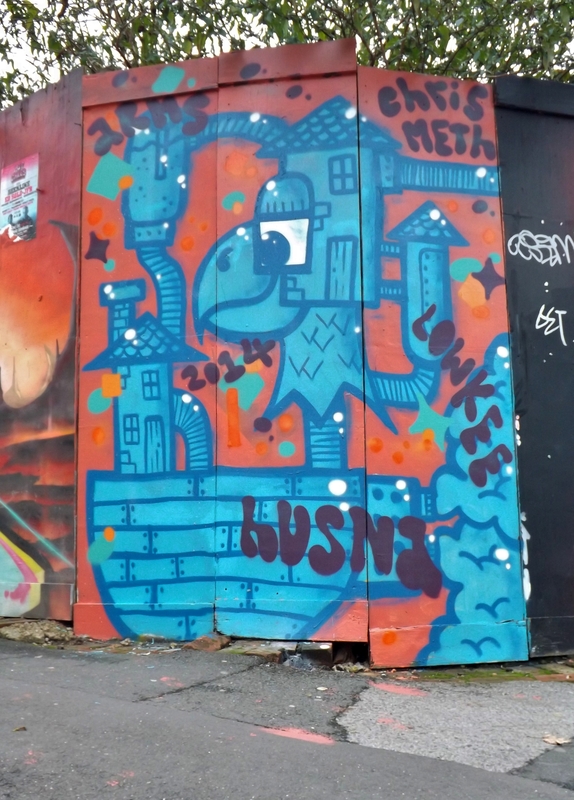 I have to say that not having been to Brum on a graff mission before I was instantly pleasantly surprised and actually veered off the COC path for a couple hours looking at all there was to see, and there was a lot, I’ll cover that in a separate post. This lovely lady by N4T4 was the first official COC piece that I saw. This wonderful board wall was not an ‘official’ part of COC but hey it’s not a bad thing that everyone wanted to be involved. Tizer and Gent 48 among others joined in the fun. The amazing work of Jimmy C, I’ve never seen it up close before, stunning. Dscreet, love all his work but my favourites are the owls. Spotted at the Custard Factory. Everywhere I turned there was a wall being painted. NHS crew. Corpse, the largest one I’ve seen. Loved this ladys’ work apologies for not knowing her name. Philth, on form as always. The Stencil Shed, not his real name, and I didn’t see a stencil either. Ennui, gutted I didn’t get to see this finished. More awesomeness. I’m sure he didn’t do all of this with a pen. Skema, paintaholic 🙂 Enzime, really like this. Bill Giles and PM(?) Andy Council, sponsored by Mr Whippy 😉 Steve Edwards beautiful study of Kingfishers playing leapfrog. Lost Souls epic production. SPZero76, not just a figment of my Instagram! Made You Look, yes it did. Lisk Bot, very fond of these handsome robots. Rmer1, blooming marvellous. Loved this… ….and this… Si2, I’m sure he’d not arrived by the time I went home, but he must have been there somewhere. Delightfully different. 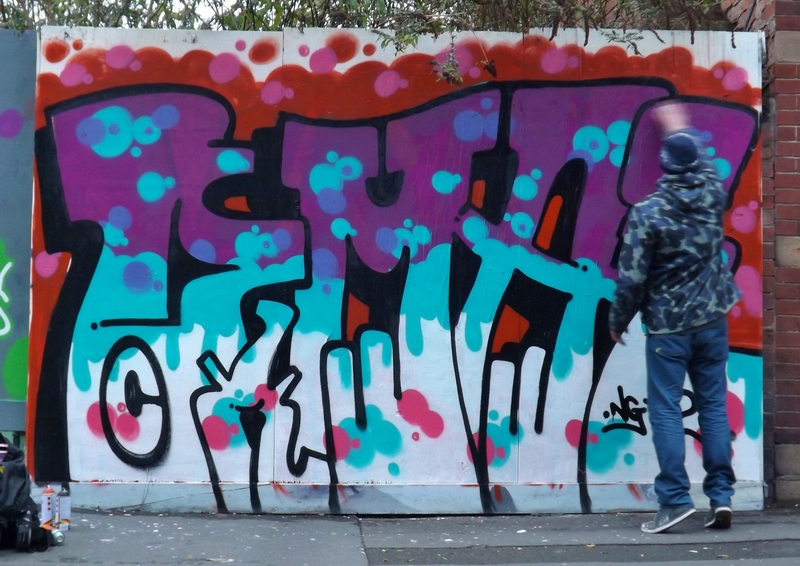 CoLor, Eug, Corpse and Tekonta Secta fantastic collaboration. Privileged to see Hoakser in action. Title and Jim Vision, I’m running out of superlatives! Mila Ks’ luscious ladies guarding the entrance to the Custard Factory…. Rainbow Rambo! Sour taking it easy,yes I know it’s an old one,but I don’t get out much. 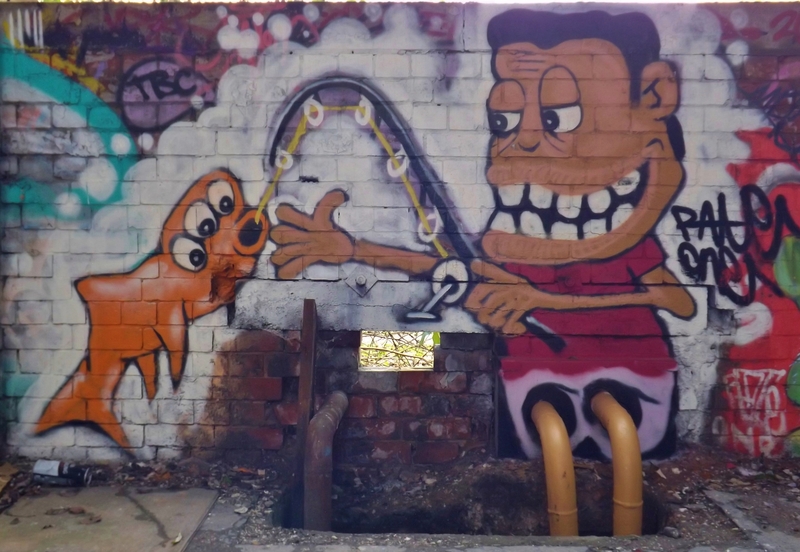 😉 Wonderful piece by Rocket 01 and Faunagraphic, spent ages looking for this, in all the wrong places. I spied a Foundry piece on his all weather wall. 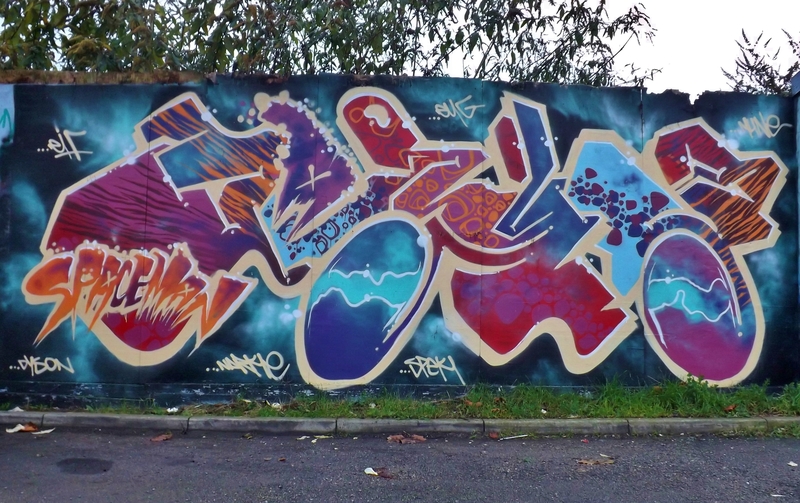 Sico, Skint and Suek freedom wall for Fista. Some keeping it colourful. Found a cheeky little Corpse sticker. Surge, Pawski and Mace beautiful memorial piece. Body Snachaz, Mars alligator. Really like this quirky little fellow. Not a brilliant photo but I didn’t have my tripod, love this piece by CoLor. Handsome chap isn’t he? As if! 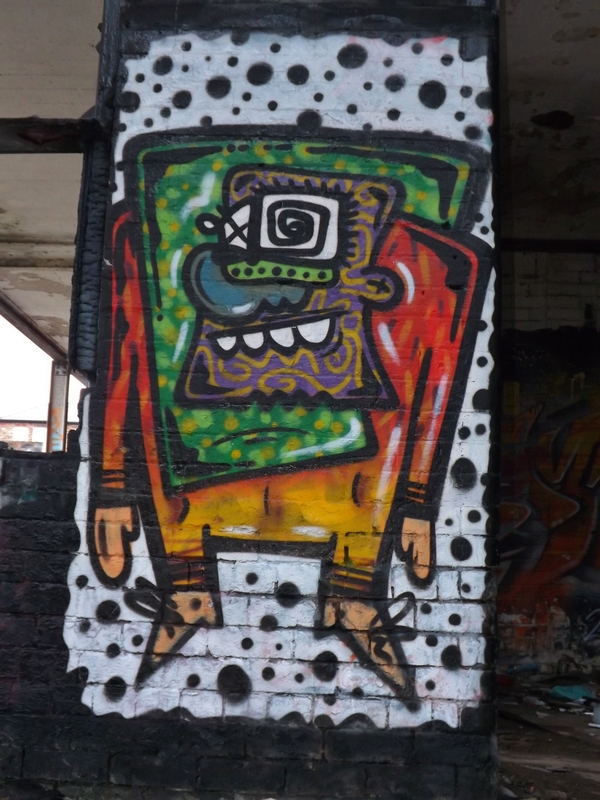 Oh and if you were wondering, I recently found a FB page for Street Art Heidelberg that had an H2i production, painted in Sheffield, as it’s banner, I never knew I was in Germany, did you? Should you ever wake up to this sight, your day is not going well. Grim reminder of what we come down to in the end. Tools of the trade, I found these shocking on many levels, not least because they were still there and appeared to be in full working order, although on my second visit, they had been effectively disabled. This creation by CoLor Art was done on our first visit….below is the same room on our next. This Corpse made me jump! Window Corpse. Colourful Corpse, really like this. Peach and CoLor – Opy-totor and Llaphalotl, bonkers. 🙂 Tekonta Secta ‘Elipan Species’ Yeti, a regular sight around these parts apparently. CoLor Art, making use of the pool with this gorgeous seal. CoLor, Corpse and Peach, an interesting if slightly mental combination. A Horse….in a dark plant room, quite high up on a wall, random. Token arty shot. One of the many many corridors in this colossal place. 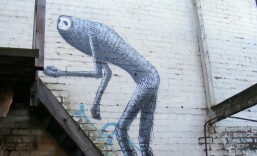 As we left I spotted this little fellow, don’t know the artist but he’s a really switched on guy! (I’ll get my coat…) Heading for the train station this handsome fellow was lurking in the bushes, Angry Face, awesome end to the day.